Since 1980, over 1,000 special operations warriors have given their lives so that we might be free to pursue passions such as the sport of baseball. When these heroes died, whether in training or on the battlefield, many left behind loved ones, including over 1,100 children. In an effort to honor their sacrifice, high school baseball teams across the country have joined together to participate in STRIKE FORCE: Runs for Warriors. STRIKE FORCE: Runs for Warriors is a national baseball program created in partnership between Operation Hawkeye, PLEDGE IT, American Baseball Coaches Association, and Special Operations Warrior Foundation (SOWF) through which high school teams can honor the sacrifice of America’s special operations community and leverage runs scored during selected games in April of 2017 to raise funds for SOWF, a top-rated nonprofit that supports family members of fallen warriors through college scholarships, family services, and other assistance. STRIKE FORCE: Runs for Warriors teams receive meaningful recognition, as well as access to Warrior Profiles and Clutch Performance Briefings providing coaches and players with insights from special operators on keys to success on and off the baseball diamond. Fans can pledge or donate as much or as little as they wish, and know that whatever they contribute will make a big impact in the lives of the families of the fallen. Their support will also position their high school baseball program to garner recognition and earn a chance to win a prize package valued at over $15,000, including athletic gear and apparel, training and field equipment, and a variety of other items donated by top baseball and other companies from across the U.S.A.
Keep track of how much teams are raising on the leaderboard! STRIKE FORCE: Runs for Warriors is presented by the below Partners and Multipliers. How Will You Earn It? 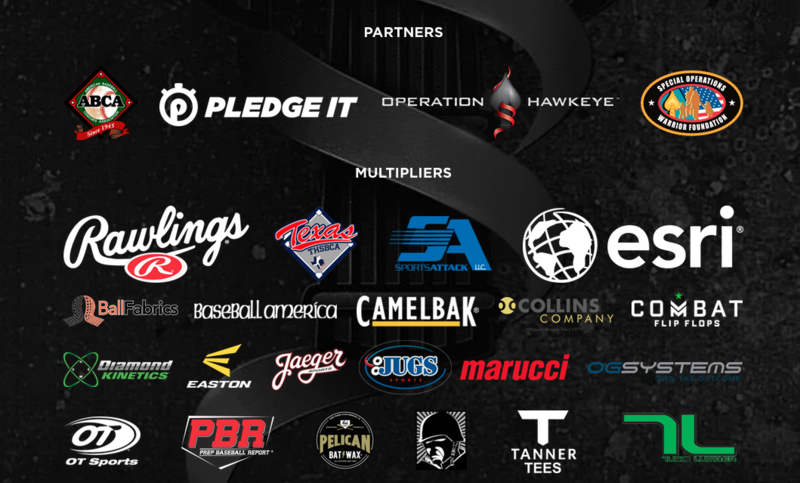 PLEDGE IT has become the leader in the online sports fundraising by empowering athletes and teams to raise money through their game day performance. Our do-it-yourself platform makes it easy to create a campaign, share it with the community, collect pledges from fans, and process donations with every touchdown, home run, or goal scored. Athletes of all levels are using PLEDGE IT to support their favorite causes by simply playing the game they love! To learn more about how you can earn pledges like STRIKE FORCE: Runs for Warriors teams, click here!